'B' Bty, 306th Brigade (2/2nd South Midland Brigade), Royal Field Artillery, 61st Division, T.F., B.E.F. Next of Kin: Son of Thomas Burston of Eastnor Cottage, Quest Hills Road. 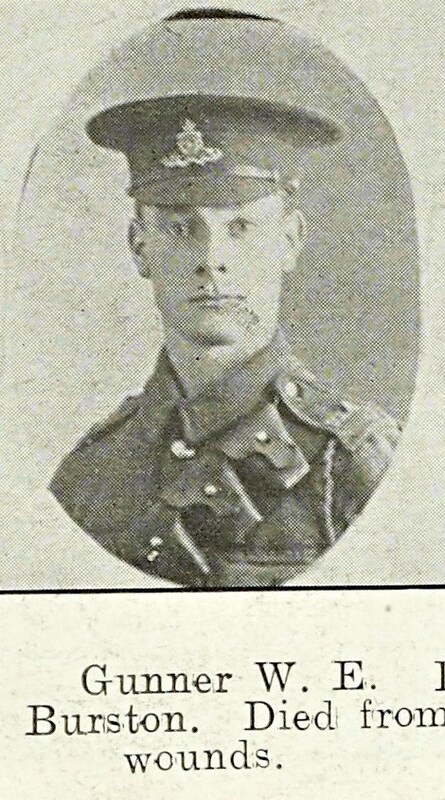 Malvern Artilleryman Walter Burston, whose home was at Eastnor Cottage, Quest Hills Road, died at a St Omer base hospital of shrapnel wounds on the 6th July 1917. He was the son of Thomas Burston, a gas worker, and was a member of the Malvern Young Liberals Association. Before joining the artillery he was employed at Lennards, Church St and afterwards at the Maypole Company’s shop.